Government-to-government partnerships are increasingly important for the well-being of rural British Columbians. The following brief overview provides some examples of government-to-government agreements, involving First Nations and adjacent municipalities, leading to positive benefits for all stakeholders. Economic development progress between local governments and neighbouring First Nations is highly dependent on establishing robust, inclusive and respectful relations and partnerships between governments. Developing this collaborative framework requires time, mutual understanding and incremental steps. The framework for these relationships has been developing since 2006, starting with the Accord of Recognition and Respect and Framework for Cooperation between the Kitselas, Kitsumkalum and the City of Terrace. 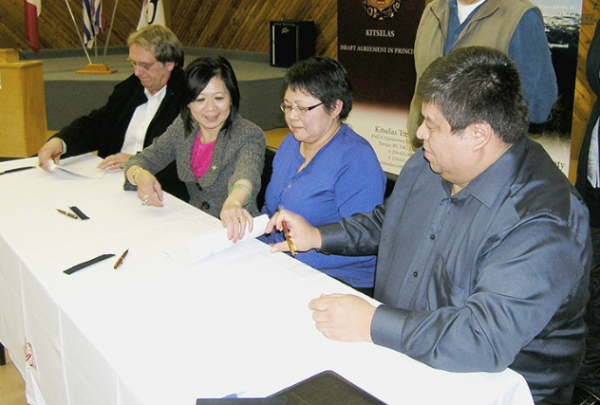 Terrace broadened the partnership with the Kitselas First Nation with the signing of an MOU for the Securing of 2200 acres of Provincial Airport Option Lands in 2007. This agreement was based on a mutual interest in securing lands from the Province to promote industrial development, generate taxation and create employment. These lands fall within the asserted traditional territory of Kitselas. Subsequent agreements were signed in 2008 and 2011, and in 2014, the Kitselas Development Corporation purchased 172 acres of the Skeena Industrial Development Park (SIDP). Approximately 1400 acres of the SIDP has been sold. Once the site is developed, Terrace and Kitselas First Nation will benefit from the property tax revenue and the region will benefit from employment opportunities. 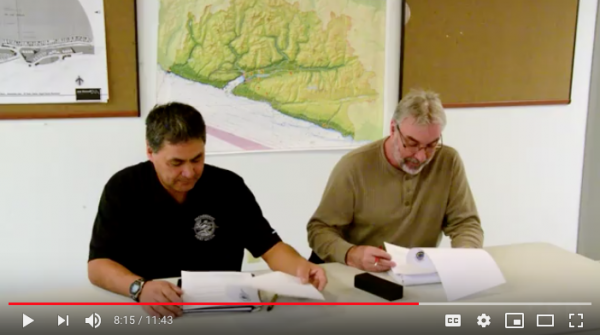 The progressive series of MOUs and agreements over time has resulted in a robust relationship between the City of Terrace, and the Kitselas and Kitsumkalum First Nations. In the spirit of the Cooperation Protocol Agreements, Terrace continues to look for opportunities to collaborate with Kitselas and Kitsumkalum and will often direct interested businesses to their respective development corporations if a proposal is not the right fit for Terrace. 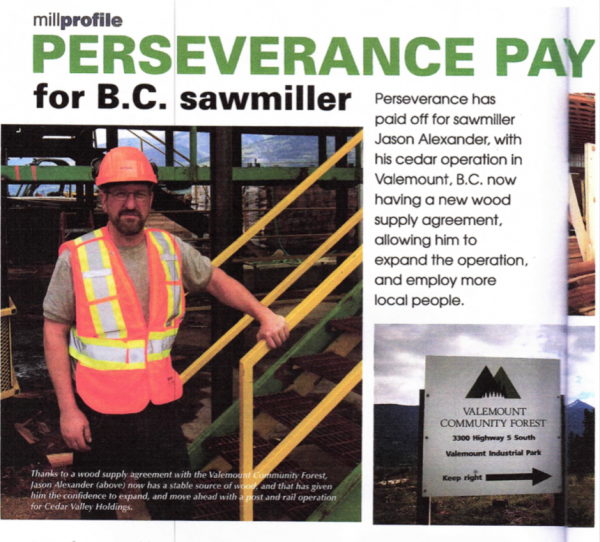 That level of trust has resulted in a Revenue Sharing Agreement between the City of Terrace and Kitselas to promote industrial development, generate taxation and create employment. Once the Skeena Industrial Development Park is developed, the City of Terrace and Kitselas First Nation will benefit from the property tax revenue and the entire region will benefit from employment opportunities. Relationship building takes patience, time and ongoing work to develop agreements of mutual benefit. Stronger together is the philosophy. As neighbouring communities we rely on each other. It is critical that we lend support to each other when we can. The success of economic development initiatives and First Nations enterprises such as the Kitsumkalum Rock Quarry and Logistics Park or Kitselas Forest Products make all of our communities healthier and more sustainable. The high cost of food and food security are problems common to all remote communities in northern Ontario. Together, three communities — Lac Seul First Nation, Kitchenuhmaykoosib Inninuwug First Nation, and the Municipality of Sioux Lookout — embarked on a journey to address this issue. Leadership decided to work collaboratively together, utilizing guiding principles of a Friendship Accord to lead them. As a result of a feasibility study and extensive stakeholder consultation and engagement, plans for a regional food distribution (RDC) warehouse to serve northern communities from the Sioux Lookout airport began to materialize. A preliminary report of the RDC project was published in June, 2017. It proposed that the RDC would service 31 remote communities, with the possibility of eventually expanding to provide access and reduced costs for healthcare related products. Given the participatory approach to the feasibility study, and the inclusive approach Sioux Lookout took towards developing its own 2020 economic development strategy, stronger partnerships have been created in the region resulting in the creation of a regional business hub in Sioux Lookout for surrounding First Nations, as well as a labour market group. This initiative is co-chaired by Lac Seul and Sioux Lookout, both of whom are now working jointly with mining, construction, and health sector stakeholders. Next steps for the partnership include creating economically sustainable communities by having Economic Development Zones, rather than urban reserves, in Sioux Lookout. Many of the issues — and opportunities — commonly faced by remote rural municipalities and districts are familiar to BC’s rural First Nations. A collaborative approach can prove of lasting benefit to all parties, in areas as diverse as resource development and food security. The Alberni-Clayoquot Regional District, located on Vancouver Island’s west coast, recognized the need for a new solid waste management strategy. It soon became apparent that the most rational way forward was to reach out to and enlist the support of the neighbouring Huu-ay-aht First Nation. The parties agreed to submit a collaborative solid waste management plan to the Community Infrastructure Partnership Project in October, 2016. The partnership soon grew to include Huu-ay-aht village of Anacla and the communities’ government businesses, as well as the Bamfield Marine Sciences Centre. The collective goal of the project is to combine services for efficiency and reduced costs, to improve services received by all residents, trigger potential local job creation, and ultimately, to move toward a comprehensive regional Zero Waste System. Currently, the partnership has finalized and will soon be publishing two RFPs, one for a solid waste hauler, and a second for an attendant to supervise two transfer stations as well as provide education to citizens on recycling. The partners currently do not divert organics but hope to introduce this service in the near future. In addition to recognizing and acting upon common economic interests, First Nations and adjacent local and regional governments — and in some cases, NGOs such as the Bamfield Marine Sciences Centre, can mutually benefit from the conceptualization and implementation of joint infrastructure projects. These can serve to lower costs, increase operational efficiencies, reap environmental benefits, and enhance understanding between governments and their respective constituents. Whether the issue regards economic development, food security, the environment, or any other important matter, there would appear to be no downside in First Nations and rural communities, municipalities, and districts seeking effective, appropriate ways to collaborate. Certainly the experiences highlighted above underscore this fact. Here’s a video pointing out that the promotion of partnerships between First Nations and their neighbouring municipalities fosters greater understanding and can create mutual economic benefits. 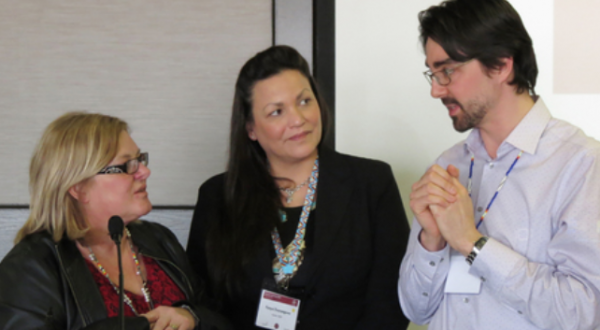 Featured Report, Government-to-Government First Nations partnerships, government-to-government, Kitselas First Nation, Kitsumkalum First Nation, partnerships, Terrace. permalink.